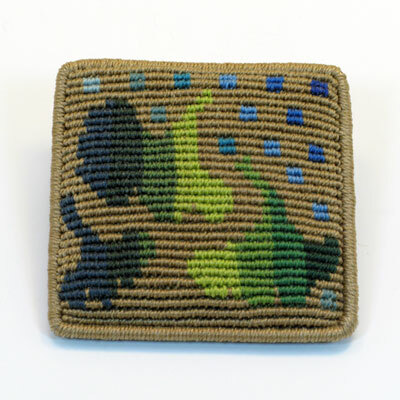 This miniature tapestry brooch is 100% Cavandoli style knotting with horizontal rows of knots snug against one another. Another homage to Diane as the previous piece. Creating these two pieces gave me a new added respect for the great technician she was. At first glance it all seems rather easy, but try knotting in this fashion and having control of the colors. It gets rather complicated right away. This piece as the previous one is of special interest to textile collectors. No gemstones are included to retain the pure half hitching technique. The cord to convert the brooch into a medallion is braided out of a single color, the background color of the brooch. 2 inch and 3/8th square brooch, converts to a medallion. Nylon cord. Copper armatures. Leather lining.